Well Halloween is very fast approaching and with that will come the half term holiday! What are you planning on doing with your kids this half term? We have spent a bit of time recently doing some different crafts to share with you for some idea's this half term. We started with a pack I picked up from Poundland which was pretty good. 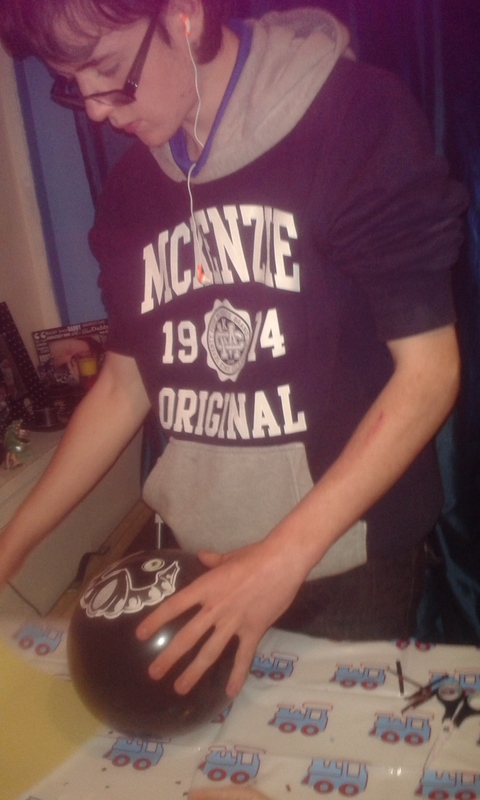 It was a kit to colour your own balloons. Here are the bits below. 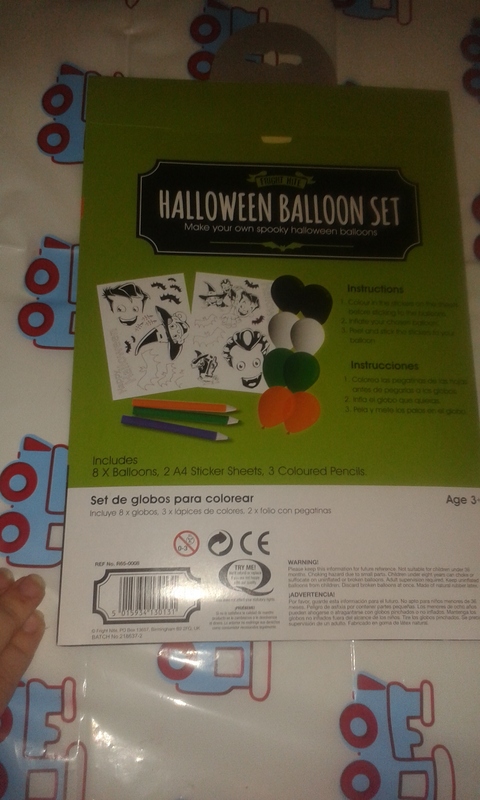 The Pack contains 8 balloons in black, green, white and orange, 3 colouring pencils and 2 sheets of stickers for colouring in. To use the kit you first need to colour in your chosen face/ features stickers. We did use some of D's colours along with those from the pack for some added variety. You will need to blow up however many balloons you will need and just add the stickers to your balloon and you are done! Both boys seemed to enjoy doing this package and although I loved doing this one the colour of balloon you use does really change your overall outcome. D quite enjoyed colouring and made me help him with his face as he liked to play with the pencils. I do recommend you have your child's colours near as you do only get three pencils. We then made some stick puppet's! We all enjoyed this one and again I did help D with his cutting (must get another pair of kids scissors! we lost our pair and now I cannot find them in shops!) We made a pumpkin and a spider. 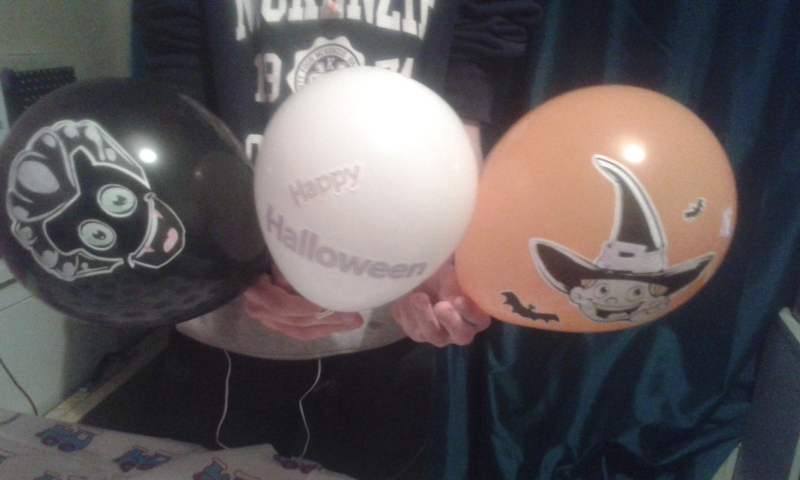 These where quite easy though we had some trouble getting the spider's legs to stick. First you will need to decide what it is you are going to make. You can really make a lot of Halloween characters with this so you can please everyone! Once you have decided what to make you will need a base shape. Our base shapes where a circle and an oval. Next you will need to decide what you need to add as features for example; eyes, mouth, nose and legs. D needed to add some shadow lines to create his pumpkin so we used some lines of EVA foam to do this. D also used some black EVA foam to make his pumpkin stem. 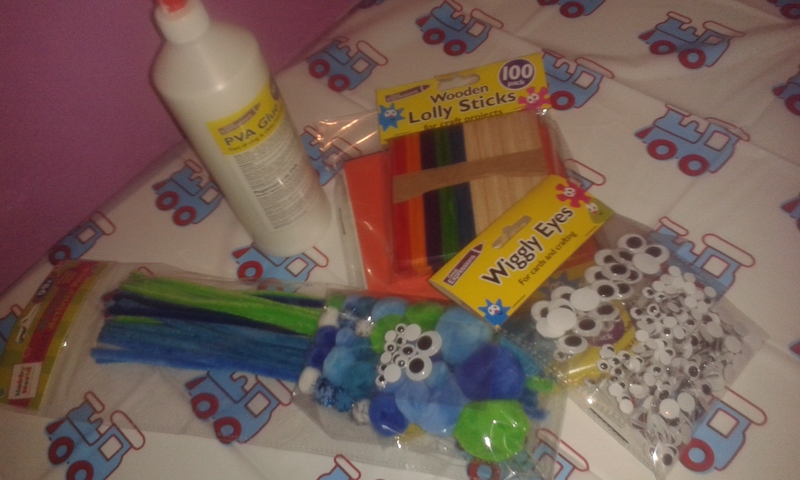 We then added some large googly eyes and a blue (D's choice) pipe cleaner for his mouth. Uncle L added some googly eyes to his spider and then attached some different coloured pipe cleaners to the back to create the spiders legs. After you have added everything you need to make your stick puppet you will need to add the sick! Because you cannot have a stick puppet without a stick. You just turn the puppet over and glue you stick on then just let it dry. 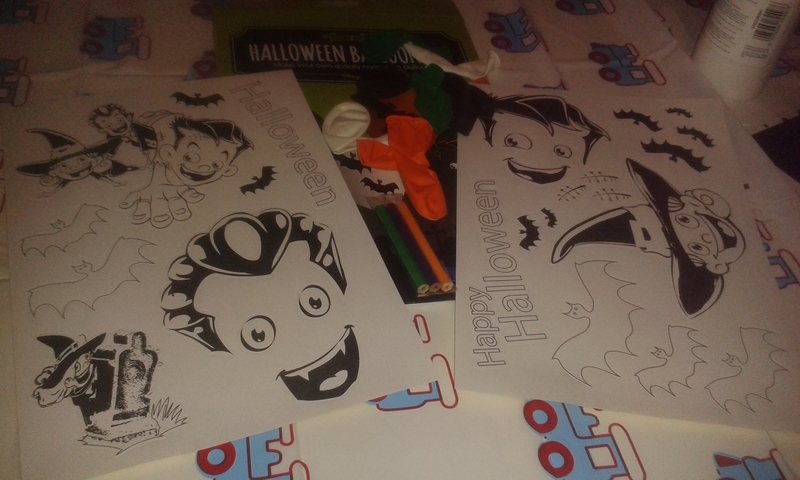 Do you have any plans or idea's for Halloween half term? Let me know in the comments or send me a link via facebook or twitter, we are always looking for more things to do over school holidays! For some baking idea's this Halloween why not check out our bat shaped stained glass biscuits?